View All Your Vehicles Within Eworks Manager and Assign Jobs with One Click. For a 14-Day Free Trial, click here! Full Featured Vehicle Tracking Software Designed to Manage and Streamline Your Entire Business from Start to End. Keep Your Eyes on The Job! 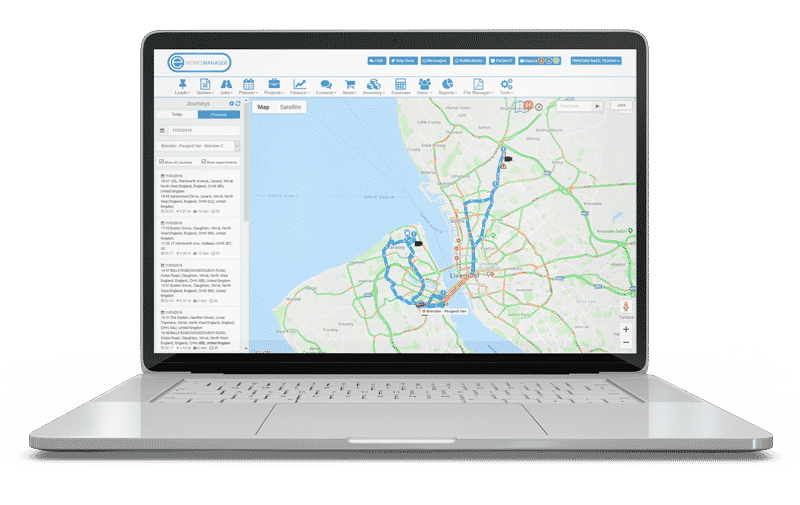 The Eworks Vehicle Tracking Software is fully integrated with our Job Management Software which is what makes us unique, setting us apart from other tracking devices on the market. Our system keeps track of your vehicles when they’re out on the field regardless of whether your drivers are parked up, taking a break or on the move. You will be able to detect their specific location via our map location. You can plan and control jobs all within one system which would save a lot of time and confusion when keeping track of past, on-going and future jobs. Our system is perfect for allocating emergency reactive jobs as you can observe and instruct your staff whilst they are out in the field. This will help you monitor time management and inform customers on the progress of jobs. You will also be able to see how long it took your driver to get to their job, whether your driver was speeding and how long they were at their destination for. Eworks provides driver behaviour reports for all your drivers such as mileage, journey reports, driver speeding reports, user and job reports so you can monitor jobs and staff constantly 24/7. You will never miss a thing! As well as being able to bring up reports on your drivers, you will also be alerted of any device that has been deactivated, for example, if one of your drivers was to unplug their vehicle tracking device, you would be alerted instantly.